Baisabi, the biggest festival which takes place on the occasion of bidding adieu and welcoming the new year in Chittagong Hill Tracts, began in Khagrachhari yesterday. The word ‘Baisabi’ is comprises with 'Bai' from Boishu of Tripura, 'sa' from Sangraing of Marma and 'bi' from Bizu of Chakma ethnic minority community. This is a symbol of unity of different ethnic minority communities in the district, sources said. 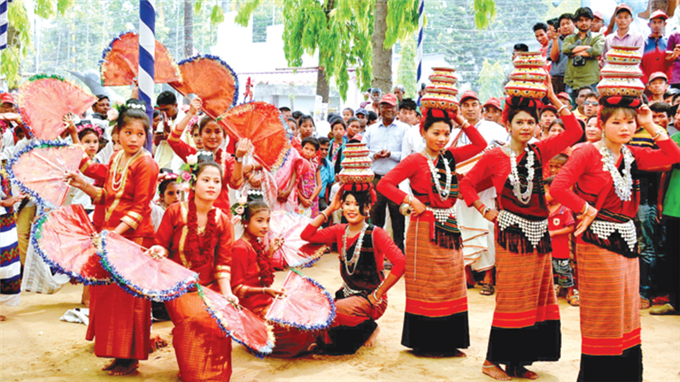 As a part of celebration, Khagrachhari Hill District Council (KHDC) brought out a colorful procession around 9.30am yesterday from its premises. Acting Chittagong Hill Tracts Affairs Secretary Md Nurul Amin inaugurated the procession. Wearing colorful dresses, thousands of people, including ethnic men, women, children, took part in the procession that paraded the main roads in the hill town and ended on town hall premises. Participants danced and sang amid great enthusiasm to welcome the new calendar year. Later, various local sports were held on the town hall premises. Khagrachari Hill District Council Chairman Kongjory Chowdhury, Region Commander Brigadier General Abdul Motaleb Sazzad Mahmud, Deputy commissioner Md Rashedul Islam, Superintendent of Police Ali Ahmed Khan, Additional Deputy Commissioner ATM Kousar Hossain, Sadar Upzilla Chairman Chunchumuni Chakma, KHDC member Nigar Sultana, Advocate Ashutosh Chakma, Mongshipure Chowdhury Apu and top profile government officials were present during the Event.